The Amphenol Pcd Electrocon line is a diverse family of rugged, high-reliability screw-terminal/edgecard connectors which combine the discrete wire termination capability of a screw-terminal block with the mass termination convenience of an edgecard connector. Electrocon connectors are designed specifically for instrumentation and programmable/process controller I/O and other discrete wire-to-board interconnect and input/output applications. The product line and interconnect concepts are particularly suitable for customization into system controller I/O portals, or module interconnects. Numerous applications exist where standard Electrocon concepts have been utilized to develop I/O interconnects tailored to serve as the system user’s entry to the system. Standard Electrocons are available in a broad range and variety of mounting and application configurations, as indicated on the following pages, and in contact spacings ranging from .098" to .591". 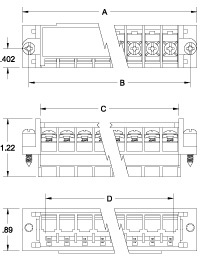 Depending on configuration, single- and double-sided versions are also available. A primary performance feature and advantage of the entire Electrocon line is the use of precision-stamped and formedbeam contacts—in either single or dual beam configurations—in all connectors. Based on many years of broad-ranging electronic connector design experience utilizing in-depth solid modeling and stress analysis, Amphenol Pcd beam contacts offer significant advantages—greater stress resistance, reduced board damage, selective gold plating, lower cost—over the blanked tuning fork contacts traditionally used in similar connectors. Electrocon connectors and contacts are designed to accept a complete board thickness range (.054--.070"), and function under extreme conditions of board warping, bending and motion. The beam contact eliminates board and contact damage possible with tuning fork contacts under similar conditions. Whenever possible, contacts are pre-loaded. The pre-load guarantees high normal force and good electrical and mechanical contact with a minimal amount of deflection. Stamped and formed contacts also allow Amphenol Pcd to take advantage of the selective plating process and provide a heavy gold plate where it counts—at the contact point. The use of selective plating also allows Amphenol Pcd to offer gold plated contacts for industrial applications at little more than the cost of tin plating. In addition to the standard Electrocon connector lines presented on the following pages, Amphenol Pcd is the industry’s leading developer and supplier of specialty screw-terminal/edgecard and screw-barrier/edgecard connectors tailored to meet specific customer application requirements. Focused on PLC and similar applications, where the need for special identity and configuration is often paramount, these connectors combine standard Amphenol Pcd elements with unique features designed for the specific application. Please contact Amphenol Pcd to discuss requirements for unique configurations. The .375" spacing ELI screw-barrier/ edgecard connector features pre-loaded, selectively gold-plated cantilever beam contacts. The pre-loaded contact will consistently and dependably exert a high normal force and reliable connection over a high range of board thicknesses and warping conditions, while the cantilever beam design eliminates board wear encountered with tuning fork contact designs. A steel #6-32 screw and separate steel nut provide high reliability wire termination. The ELI also features integral mounting hardware and a swiveling snap-down, screw-terminal cover that provides insulation, protection and ease of marking. 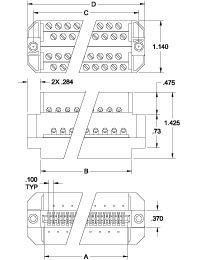 The rugged .375" ELE wire-to-board screw-barrier terminal block offers gang disconnect capability in a popular screw clamp-style terminal block configuration. Selectively gold-plated, bifurcated cantilever beam contacts eliminate the board damage possible with the stamped tuning fork contacts commonly utilized in this application. Additionally, the ELE assures a high reliability wire termination through use of a #6-32 SEM nickel-plated steel screw and clamp, retained by a separate steel nut. This design overcomes the thread stripping problems inherent in blocks that thread the thin contact material to retain the clamping screw. 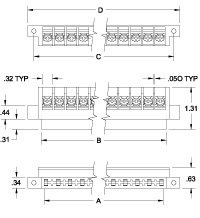 Connectors are available with special marking and configuration adaptations, and in sizes not indicated in the table. Please contact Amphenol Pcd for details. The .200" ELD wire-to-board edgecard terminal block features selectively gold-plated cantilever beam board contacts and a moving cage clamp wire termination. Wires are installed in line with the plane of the board and contact, and can be trained in any direction. 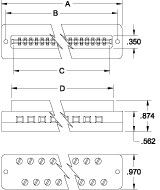 Key to the superior performance of the ELD is a unique cantilever beam contact that eliminates the board damage possible with the stamped tuning fork board contacts commonly used in similar connectors. The dual cantilever beam also assures improved performance under board warping and bending conditions over the full .054" to .070" board thickness range. Moving cage clamp contacts provide direct, high pressure wire termination without strand damage. The .156" ELB wire-to-board edgecard terminal block features selectively gold-plated cantilever beam board contacts and a moving cage clamp wire termination. Wires are installed at right angles to the plane of the board and contact, and alternate top and bottom entry. Key to the superior performance of the ELB is a unique cantilever beam contact that eliminates the board damage possible with the stamped tuning fork board contacts commonly used in similar connectors. The dual cantilever beam also assures improved performance under board warping and bending conditions over the full .054" to .070" board thickness range. The compact .156" ELC wire-to-board edgecard terminal block is designed for panel-mounting with bottom wire entry. 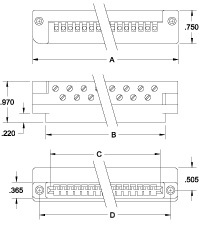 Connectors are available in single and double-sided configurations to meet specific application needs. The ELC features a bifurcated cantilever beam contact that eliminates the board damage possible with the stamped tuning fork board contacts commonly used in similar connectors. The cantilever beam also assures improved performance under board warping and bending conditions over the full .054" to .070" board thickness range. The ELH .100" spacing, high-density screw-terminal/edgecard connector features the highest contact density of any screw termination connector system available. 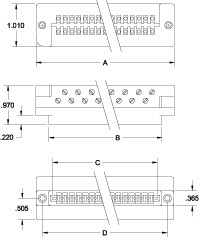 Connectors are available in single- and double-density versions and range in size from 10--40 and 20--80 contacts, respectively. Bifurcated, selectively-plated contacts are pre-loaded to guarantee high normal force and good electrical and mechanical contact with a minimum of contact deflection. This assures reliable performance under extreme conditions of board warping, thickness and movement. 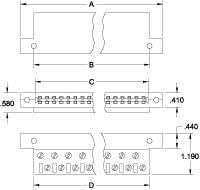 Connectors are designed for side wire entry. Screw terminations are actuated from the rear of the connector. Single-density wire bundles train to one side (left or right) of the connector. Double-density bundles train to both sides. 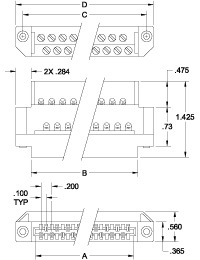 Connector sizes listed are standard configurations. Contact Amphenol Pcd for minimum order quantity requirements for special sizes and configurations.